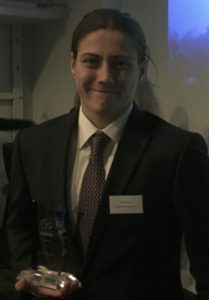 On the 21st of March Luke Holman presented on his PhD work at the P1 Marine Foundation Student Awards hosted at the Royal Institution of Great Britain, London. Luke was awarded runner-up in the prestigious national competition and presented alongside four other prize winners. The P1 Marine Foundation is a UK registered charity focused on safeguarding and protecting the marine environment through awareness, education and partnerships. The fifth annual P1 Marine Foundation National Student Awards supported by The Crown Estate, Marine Conservation Society and the Institute of Marine Engineering Science and Technology. 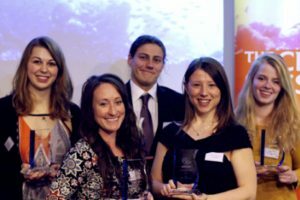 The Awards evening celebrated and rewarded students in higher education whose projects help to provide solutions to the threats to the marine and coastal environment.